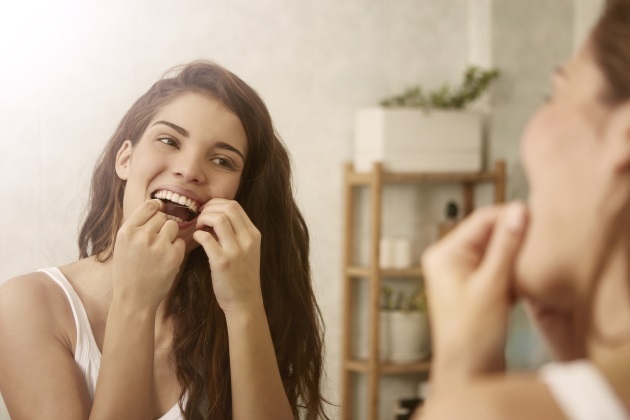 Potentially harmful chemicals often used for their water and grease resistance, per- and polyfluoroalkyl substances (PFAS), may be harmful to our health and in common household items, including Oral-B Glide dental floss, according to a peer-reviewed study. The floss might lead to higher levels of toxic PFAS chemicals in people’s bodies. Perhaps somewhat shockingly, the researchers say they found higher levels of PFHxS (perfluorohexanesulfonic acid), a type of PFAS, in women who flossed with Oral-B Glide compared to those who didn't. The study was designed to explain how these chemicals enter the human body. The results were published in the Journal of Exposure Science & Environmental Epidemiology produced by members of the Silent Spring Institute in Newton, Massachusetts, and Public Health Institute in Berkeley, California. Researchers told USA Today that Oral-B said it didn't find any of the substances in the study in its floss. The company issued this statement: "The safety of the people who use our products is our top priority. Our dental floss undergoes thorough safety testing and we stand behind the safety of all our products." Oral-B floss isn’t the only place that PFAS can be found in consumer’s lives. It resides in stain-resistant carpet or furniture, and people can be exposed to it if they live in an area where the drinking water has been contaminated with the substances. Researchers said they also found that African-American women who ate food from coated cardboard containers had higher PFAS levels for four of the chemicals studied compared to those who didn't. These things are nothing to take lightly. The U.S. Environmental Protection Agency says "there is evidence that exposure to PFAS can lead to adverse human health effects." Having breached the public consciousness, in late January, Reps. Dan Kildee (D-Mich.) and Brian Fitzpatrick (R-Pa.) called for the establishment of a new bipartisan task force in the U.S. House of Representatives to address the urgent drinking water contamination crisis caused by the toxic fluorinated chemicals known as PFAS. "No one has worked harder than Reps. Kildee and Fitzpatrick to bring attention to this growing contamination crisis," said Environmental Working Group legislative attorney Melanie Benesh. "The fact that legislators in both parties are working together shows how urgently PFAS contamination transcends partisan politics. It’s time for Congress to stop new PFAS chemicals from going on the market, require monitoring to determine the extent of the current crisis, and make the investments necessary to clean up the mess." The task force will work to establish PFAS cleanup protocols and even bring the issue related to the contaminants into the House agenda through informational and educational events, crafting legislation, meeting with committees and congressional leadership, and fighting for more robust funding through federal appropriations. According to the Environmental Working Group, EPA tests have detected PFAS pollution in public water supplies for 16 million Americans in 33 states, but those amounts are considered significantly underreported. EWG says it and researchers at Northeastern University have tracked 172 PFAS contamination sites in 40 states. EWG also estimates that water supplies for as many as 110 million Americans may be contaminated. EWG’s research has documented the presence of PFAS chemicals in everyday items, including fast food packaging and even umbilical cord blood. Floss, other hygiene products, nonstick cookware and microwave popcorn bags are among the various products the Centers for Disease Control lists as potentially containing PFAS. Exposure to certain PFAS chemicals, like perfluorooctanoic acid (PFOA) and perfluorooctanesulfonic acid (PFOS), has ties to cancer, ulcerative colitis in adults and thyroid disease in children, among other health problems, researchers said.